FINALLY, YOU FOUND THIS "HIDDEN TREASURE"! WELCOME TO A WEB SITE OF CLASSIC MOVIE STAR MEMORABILIA. IN THIS WEB SITE YOU WILL FIND TREASURES THAT HAVE BEEN BURIED FOR DECADES, SEEN BY NO ONE BUT THE NEWSPAPER THEY WERE PACKED IN!!! THIS IS--- FIRST & FOREMOST--- a SITE DEDICATED TO MR. ROCK HUDSON. BUT THERE ARE, IN ADDITION, ITEMS ONCE BELONGING TO ROCK’S FRIENDS & ASSOCIATES, PEOPLE LIKE ACTOR GEORGE NADER, ELIZABETH TAYLOR, ROCK’S COMPANION,TOM CLARK, AND MANY OTHERS! WHEN YOU LOOK THROUGH THESE ITEMS YOU ARE LOOKING THROUGH HOLLYWOOD HISTORY!!! 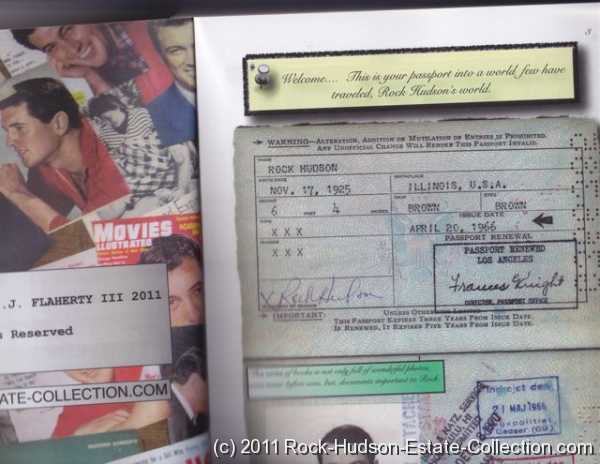 This is a site filled with Rock Hudson memorabilia, genuine, authentic items directly from Rock Hudson's estate. These were Rock Hudson's belongings!!! They were his personal possessions from his homes--and now are being offered to you, his fans, as per his personal request. Everything from his private book and photo and movie collection to his clothes and furniture and artwork, and items from his files including many, many signed contracts. I have been diligently combining, refining, reworking and adding even more entertaining recollections and information to the stories from my first two books! And a prospective agent/publisher is reading them at this writing! 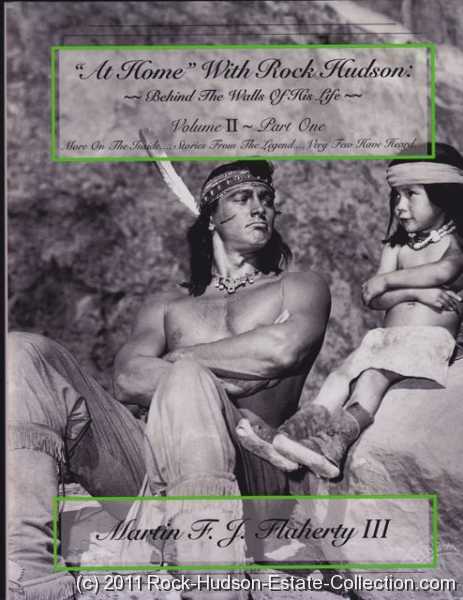 Well, it's here...the second in my series of "At Home" with Rock Hudson books!!! "More On The Inside, Stories From The Legend, Very Few Have Heard"
It is about 20% larger than the first book and filled with many more images and wonderful photos than the first book. I want to thank you all for being so patient. And...due to problems with the publisher and rather than delay its release further, I'm sorry to say that some of the over 800 photos look a bit more "vintage" than I would have liked. It's only a few, mind you. But...as I said... there nothing that can that can be done at this point without further delaying publication. I will be selling the book on my site for much less than at Amazon or any others out there... plus if you get it here, I can sign it personally to you! Another difference in this volume from the last is that I will be accepting pre-paid orders from my customers. That means, I can order a larger volume of copies for the first printing from the publisher, ensuring greater savings which will be reflected back to you. Per usual, I accept PayPal with my on-line ordering, and as soon as I have acquired a large enough volume of orders, I will go ahead and place it with the publisher, CreateSpace. This will be the fastest way of aquiring a copy as it won't be out anywhere else for a short while longer. I know you Rock Hudson fans will be ecstatic with this new set of tales from the inside...so place your orders soon! And don't forget to include any special messages or names you want included in your autographed edition! Can't wait to hear from you! HOW MANY ITEMS THAT ARE NOT EVEN ON THE SITE YET THAT I HAVE. BOXES I HAVE NOT SEEN FOR SOOO LONG AS THEY WERE PACKED SO DEEP IN MY STORAGE UNITS. IT MAY TAKE A BIT OF TIME, BUT I WILL GET TO THEM AS QUICKLY AS POSSIBLE. SO BE PATIENT, KEEP WATCHING AND THANK YOU AGAIN. My first in my series of books is now available!!!! It is wonderful!! LARGE 8.5" x 11", 312 pages, over 500 images and over 70,000 words in over 20 stories. It is an Un-Corrected proof, which means it has not been shrunk down by an editor. The stories are whole. The proofs will be collectable and very valuable after it gets picked up. I thought I would offer them now to all my diehard fans. You deserve it. I am selling them on my site here and can issue a Certificate of Authenticity and personally sign them to you. THE FIRST CHOICE AND BEST BUY IS TO GET IT FROM MY SITE. I will sign and issue a Certificate of Authenticity for each one of you that wish to have one even if you purchased from one of these sites as well. 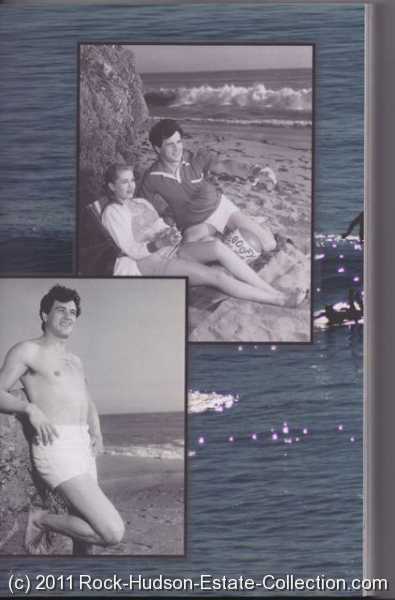 This book is probably the most personal book into the lives of Rock Hudson, George Nader, Claire Trevor, Roddy McDowell, Myself, Elizabeth Taylor, Rock's friends-servants-lovers, Marc Christian (the real story never before been told until now) and more, ever written. It is the truth showing no bias. AMAZON.COM, IT WILL HELP GREATLY. THERE ARE MANY, MANY MORE FANTASTIC ITEMS COMING SOMETIMES DAILY!!! FOR THE LATEST ADDITIONS TO SITE!!!!!!! Hey everyone!If you haven't seen it yet, below is a few links to Discovery Channel's television series entitled "The Will". 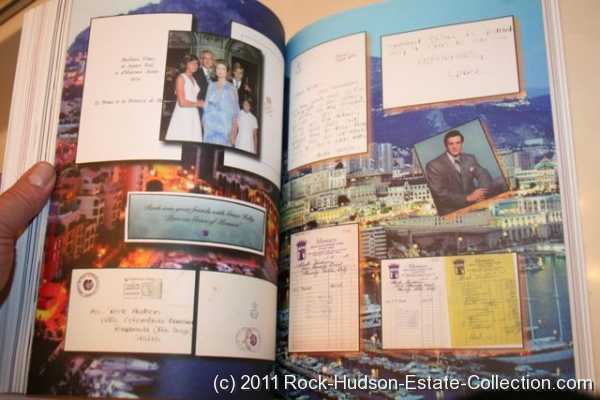 The series profiles real-life stories of wills, trusts, and estates, and this one is about Rock Hudson and his estate! To get the whole story, step by step and in it's entirety you must read my book. 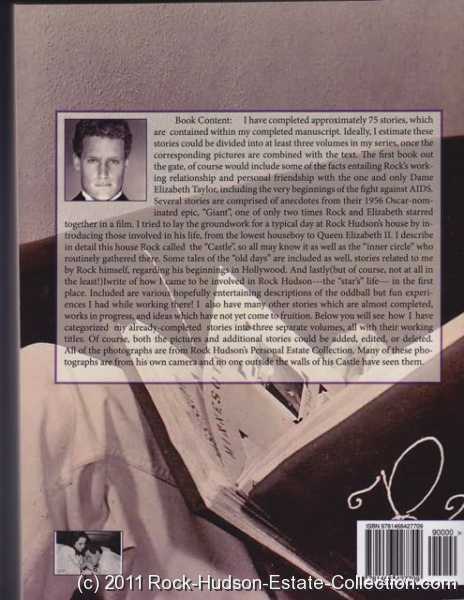 In it, I also introduced my yet-unpublished and highly anticipated series of books which examines Rock "Behind the Walls of His Life". That’s right, I have spent years and finally!!! 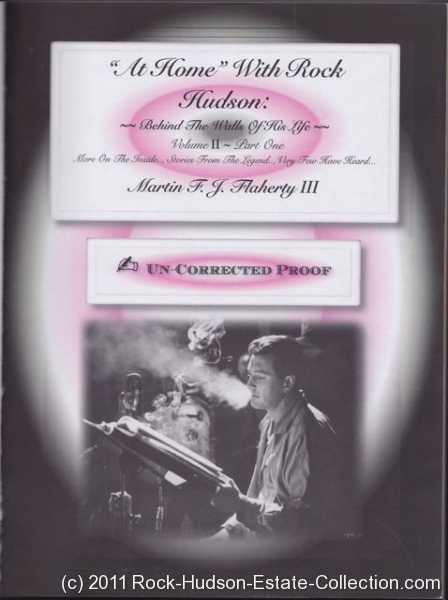 I have completed my first in a SERIES OF BOOKS about our Rock Hudson!!! PERSONAL HOME MOVIES FOR SALE. MOST NEVER BEFORE SEEN!!! EXCELLENT CONDITION!!!! SO CRISP AND CLEAR, HD!!! HERE YOU CAN SEE THE VALUES OF ROCK HUDSON & GEORGE NADER'S SIGNATURES. 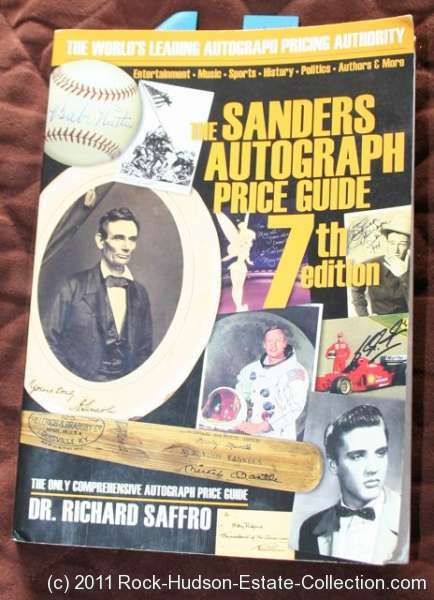 This book is very well respected in the autograph business. 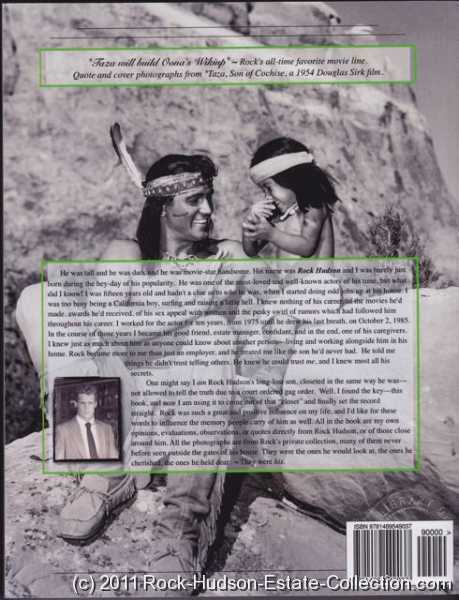 In this web site you will find a piece of Rock Hudson, George Nader, and Tom Clark's lives. Items from there Everyday use to Clothing they wore. Things from the Living Room to the Bed Room. From Furniture (some used in movies ) to objects d` art. We have A Collection of Rock Hudson's scripts. We have A Collection of George Nader's scripts. We have Rock Hudson's 8 x 10 Movie Still Photographs from every film he was in as well as personal photos, travel photos, television stills and more! We have George Nader's 8 x 10 movie still photographs, personal photographs, etc. as well. We also have larger photos of both George Nader and Rock Hudson. We have Rock Hudson's Furniture from Side Boards to Head Boards. We have Egyptian Antiquities, that were presents from President Nasser of the U.A.E. to George Nader. We also have Rock Hudson and George Nader's Home Movies. IMG_0012 We have Rock Hudson's Passports, Report Cards, Navy Cards, Navy Photo Albums and other related Navel Items such as Medical History, Pins, Etc. 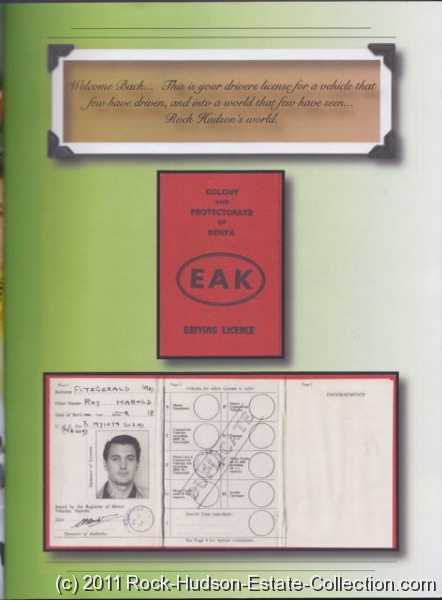 We have Rock Hudson's Birth Certificate's and his Official Death Certificate with the original stamp. The copies ordered by the Estate, not copy's. We have Rock Hudson's Awards, Degrees, Yearbooks that are signed on the inside to Roy Fitzgerald, Rock Hudson's adopted name. Rock Hudson was born Roy Scherer, Jr. See how his school mates felt about him. Rock Hudson had much adored and respected his mother. He didn't legally change his name until she passed in 1976. He was always very fun loving. Rock Hudson was a great friend to many. He had a great sense of humor, a great laugh, a wonderful smile, a love for life and he loved to play practical jokes on the people closest to him. He loved to play bridge, work in his garden, build fires in his out door fire places and recite limericks. Both he and George LOVED limericks. When George Nader would visit, sometimes he would just walk in through the front door and into the courtyard and before the small talk they would gear up for a "Limerick Showdown." George and Rock, would walk towards one another, then stop a short distance apart as though entering into a fist fight, then would just stare at one another. Face to face, they would be loading up their brains for the showdown. Socializing and Work around "The Castle" would stop for all and we would gather around to watch and listen. The chitter-chatter of the staff and friends would slowly come to A hush. Everyone trying to relax there facial muscles and not laugh as we had seen these before and knew somewhat, what to expect. Everyone trying to wipe the tattooed smiles from our faces. Anticipating what was going to happen, the mood would fall to an even Hmmm and one would start to hear their own heart beating. Rock would start with A "There once was a woman from Nantucket,.........," there would be a pause after he finished, accompanied by a scratch on the head from George, a blank stare and then he might just look around. George would then respond with A "I saw a brave man at the docks,.........", every one around would break out in laughter only moments later go to quiet in anticipation on the next response. Also, because of the tension of the seriousness of it all. After Rock calmed down his wonderful chuckles, he would go stoned faced, rest his Chin between his thumb and fore finger, face down and look up, then as if having a revelation, his face would bounce through a multitude of expressions. After catching his breath and trying not to laugh he would calmly proceed with A "I heard of a woman in Yorkshire who wore a bunt,.........." Well, we would all fall apart, grasping at our cramping stomachs and rubbing our watering eyes. Laughing so hard, no more sound come out of our fully opened mouths. The small talk would ensue as the hilarity wound down and they would go into the house. Everyone else would go back to what they were doing and the day went on a little more "Chipper." Rock Hudson loved his home and his possessions that were collected from all over the world. Brought back to be enshrined in his home, "The Castle." He had no siblings nor close living relatives when he passed. When he passed George Nader was one of the Heirs of his estate along with three charities. They shared many possessions and traded back and forth while the never ending redecoration of their homes took place. As I was one of the close circle of friends that surrounded him, I too participated in this "Trading Circle." It would have given both Rock Hudson and George Nader great pleasure to know that their personal possessions were now available to their fans. George Nader had no siblings nor close living relatives upon his passing either. George had collected his lifes possessions from either his travels or his family. From Aunts and Uncles to Parents, Grand parents to Greats and Great, Great Grand Parents. George had a bit of them all. He held close these items. Some of these offered for sale in this site. Rock Hudson started his acting career in about 1948, won fame with "Magnificent Obsession in 1953, and was nominated for an academy award for "Giant" with Elizabeth Taylor and James Dean in 1957. Even though he lost to Yul Brenner for "The King and I." This finally gained him the respect he deserved from within the Industry. He grabbed another audience when he started doing comedy in 1959 in movies like "Pillow Talk." He was terrified to take on this challenge in the beginning as comedy takes such precise timing and delivery. Something he was not used too at the time. He had been, by that time a much more Dramatic Actor. Everyone could see that he would quickly adapt to comedy, as he had such a great sense of humor. Though Rock Hudson and George Nader never starred in a film together, They did do a photo shoot at the Salton Sea. It was fun for both as it entailed Water Skiing. A sport they both adored. We have stills and film of this event. We have George Nader's Baby Shoes the Bronzed Shoes and the Real Leather Baby Shoes. We also have Special Edition Numbered Copies of George Nader's Book Chrome. Published in 1978. Chrome, A Gay Science Fiction Novel, sold out at Pick Wick Book Stores its first day of release and quickly became a collectible. It is also used as a Teaching Tool in the U.C.'s. George Nader brought real notoriety and fame to himself when he took his career to Europe in his role as "Jerry Cotton-F.B.I. Agent". Jerry Cotton was and still is a bi-monthly, in print since 1946. 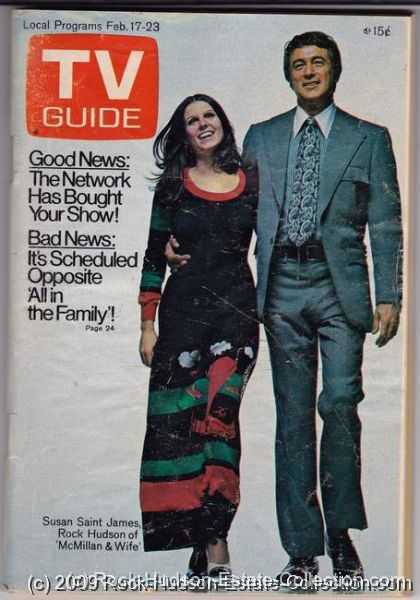 During the 1960's they produced 8 episodes in which George Nader was the star. If you buy Medley's Kentucky-U.S.A. Whiskey in Germany today, George Nader's picture is on the bottle. He then returned to the United States and continued making films until he was diagnosed with Glaucoma which forced him out of the business as the key lights might have blinded him. He then directed his energies towards being an author. And a Fantastic Author he became. He is also known for many other roles on Television, The Big Screen and Stage. AND ONE OF GEORGES FAVORITES SAYINGS WAS: "IT IS AN OLD SPANISH PROVERB, THE BEST FORM OF REVENGE IS NOT BEING MY FRIEND"
George Nader and Rock Hudson were great friends along with Tom Clark and George Nader's life partner. To share a piece of their lives is truly special. We hope you will enjoy seeing and being a part of their lives. published by Smashwords and is now available on Amazon's Kindle. FROM THE ESTATE AND A LIFE TIME GUARANTEE OF AUTHENTICITY"
Could you please keep me informed of any of Rocks future sales thank you kind regards Martin Dalton. I know Rock Hudson made needlepoint. I am wondering what designs he made and how much each of his needlepoints cost? I haven't been able to find anything. Thank you. Great website !!! Give my love to Julie and her son. Please contact me if you want. I'm on Facebook as Will Loper or email me or send me a message. The letter he typed to me on Universal City paper, signed, and sent to me in 1953 states "... when I was Roy Fizgerald," not "Roy Scherer." I am not offering this gem for sale but would like an explanation of his last name. Lovely memories and info of a great actor and culturally sensitive man it seems. Martin, you've done him proud!! Rock and Jean starred in the 1959 film THE EARTH IS MINE together. I wonder if her autograph is on the wall at his beach house? I look forward to any info. What a tribute to one of my childhood heros! Having gone through the book once(the photos from the star's collection are amazing )& then ingesting more thoroughly every delicious morsel of a word from each story, well..burp! We gay men need to honor this man who lost not only his life but his reputation as an actor,all in the name of a shyster named Marc Christian. Thank God we now have the real story. A Fantastic Friend and Keeper of Rock Hudson's Personal Effects. Thank you Marty for the chance to own something from one of my all time favorites. The communication was hands on and very special. All questions answered by Martin and the items arrived presented in the most professional and with the most personal touch in packing. If you get a chance you must purchase Martin's first book on Rock. If is filled with things you never knew by a man who knew him better than most. The book is set up in such a way it makes for a GREAT read! This is the best Rock Hudson book I have read...EVER!The stories are well written and the pictures are more personal than any of the ones I've collected in the past. I can't wait to share it with my friends. 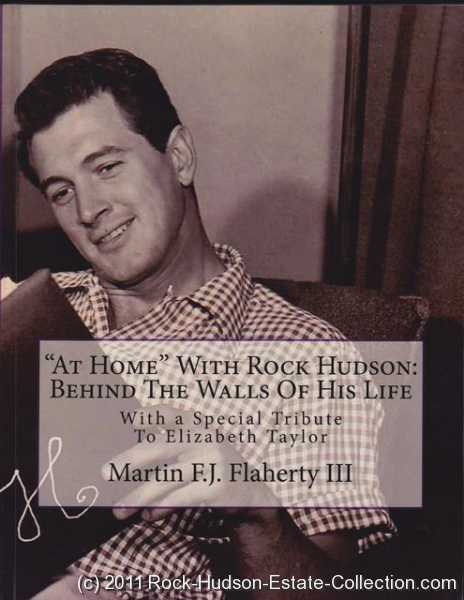 Marty gifts each of us with a truly precious glimpse into the very personal life of Rock Hudson, with stories & pictures unlike any we have heard or seen before. I thought the website was wonderful, but now we have Marty's memories as well, and what amusing and interesting and informative memories they are! 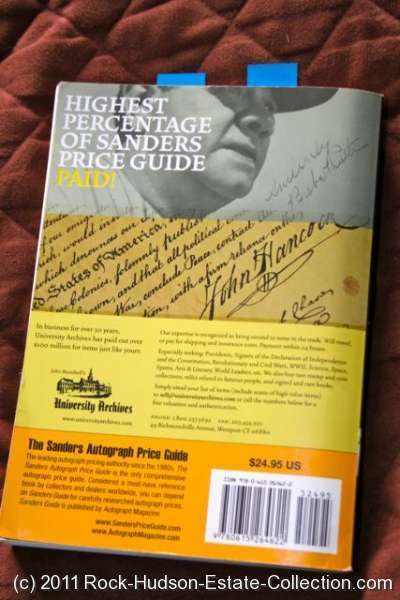 Anyone who buys this book will come out with a greater understanding of the man whom we fans have always adored. Great Book! Couldn't put it down. Great Stories, Great photos. Cant wait to come to San Diego and visit...see you in January 2011! Thank for posting all. Rock was such a handsome man with class & dignity. He seemed to be very kind to others, generous, with great sense of humor, often smiling & laughting. I hope he lived happy despite his closeted personal life. Today things would be a lot different. Received my 2nd order and can't begin to say what a treat it was. It arrived like a finely-wrapped gift, very well-protected. Thanks, Julie,& also for the extra gift! And a BIG thankyou to Marty--your service has always been courteous & beyond friendly. I highly recommend to anyone rock-hudson-estate-collection.com...a class act all the way! The mirrow was well packed and very special. The seller is very nice and worked with me on price. I will be back. What a terrific site full of history and yesteryear. Wow! FAST, PROFESSIONAL, TRANSACTIONS. LOVED THE PIECES I PURCHASED. MANY THANKS. YOU GAVE ME A GREAT DISCOUNT ON THE PIECES I BOUGHT AND WERE VERY PROFESSIONAL.